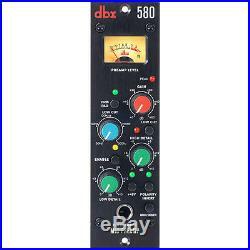 Dbx 580 Microphone/Instrument Solid State Single Channel Mic Preamp VU Meter. The dbx 580 Microphone Preamp is the perfect partner to your microphones, providing sonically-transparent gain that will reveal the detail and audio signature of even the most esoteric microphones. It will transform their low level output signal to a high level, high current output for direct connection to the line level inputs of your mixer, sampler or any other recording medium that accepts line level, analog input. With its modular 500 Series design, the dbx 580 delivers up to 60dB of gain, features a variable-frequency Low-Cut Filter and unique Low and High Detail Equalization Controls, a 20dB Pad, Polarity Invert, +48V Phantom Power, a Front Panel Instrument Input, VU Metering and Peak Indicator. Premium low-noise Mic Pre with up to 60dB of gain. Low and High Detail Equalization. 1/4 Front Panel Instrument Input. +15 dBu balanced or unbalanced (20dB PAD disabled) +35 dBu balanced or unbalanced (20dB PAD enabled). >60 dB; typically >70 dB from 20 Hz - 20 kHz. Balanced 30 Ohms, unbalanced 15 Ohms. Typically > -128.0 dBu, 150? Source impedance, 22 kHz bandwidth, unweigh. 20Hz - 20kHz, +0/-1dB; <10Hz - 30kHz, +0/-3dB. <0.006% typical, 20Hz - 20kHz, 0dBu out. 80 mA per power rail. Dimensions (H x W x D). 5.25" x 1.5" x 6 (13.34 cm x 3.81 cm x 15.24 cm). 1.3 lbs (0.59 kg). 1.7 lbs (0.77kg). The item "Dbx 580 Microphone/Instrument Solid State Single Channel Mic Preamp VU Meter" is in sale since Friday, March 17, 2017.